You either love them or hate them. I’m a lover not a hater. I can’t imagine why someone would turn his or her nose up at a Fritschi Diamir binding. I’ve been charging the local ski hill and side country for the last 10 years almost exclusively on Fristchis. Okay, I’m no professional ski racer, I’m not even a badass freestyle skier hucking 50ft cliffs but I hold my own on the slopes circling (rather hopefully) ‘expert’ on the rental forms when taking advantage of demo days. I just can’t fault the performance of the Fritschi Diamir bindings. So, as the Eagle proverbially lands with this new and improved version, we ask, what’s the big deal? Perhaps a 16 din? Not quite. But there are certainly improvements that make this new model worth a look, regardless of your brand loyalties. So as this new Fritschi Diamir Eagle soars into your local gear store, is it going to be like the flight of Icarus? (Google it). Let’s take a closer look. As the man in the store says: “The lightweight Fritschi Diamir Eagle combines a gliding, natural stride with the downhill performance and safety features of a high-end alpine binding.” Sounds promising. 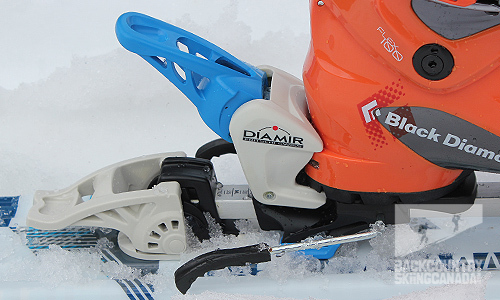 The Fritschi Diamir Eagle binding fits skis of 67mm width plus. Diamir’s Gliding Technology has enabled construction of a baseplate that moves to allow full release capability, even in difficult uphill situations. The Fritschi Diamir Eagle has also been constructed with the touring pivot being set back 23 mm, which promotes a more natural uphill stride as the foot is allowed to roll more fluidly, so comfort is greatly enhanced while breaking trail. The rotating toe piece meanwhile allows lateral release with elasticity of 20mm from left to right. Combined with the high restoring force, this reduces the number of unintentional releases to a minimum. On the downhill the Fritschi Diamir Eagle proves to be solid and robust. In order to ensure that you only come out of your ski in an emergency, the binding only releases after a long dynamic travel of 13 mm. 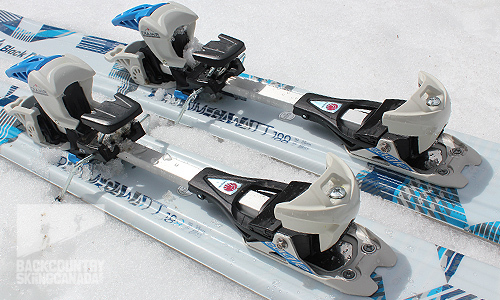 A professional mount and fitting naturally ensures optimum foothold for all touring and alpine ski boots. The Fritschi Diamir Eagle binding comes in three sizes and fits both touring and alpine boots with an updated and adjusted toe piece. I’ve always liked the easy switch from touring to downhill mode and the ease of using the end of the ski pole to make the adjustment. If you can pull off the fancy-pants skin-peal with your skis still on the Fritschi Diamir Eagle binding permits this as you do not have to exit the binding in order to switch over. The main improvement that I noticed from my many years of service to the Fritschi Diamir brand was the wider binding support under the boot heel. On steep switchbacks there is no doubt that this enhances stability on the up track. 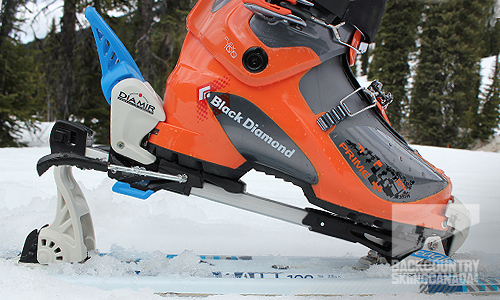 Four Level Heel Height – this offers the simplest operation for skinning up the up track. What I love is the ease of adjustment with the end of the ski pole. 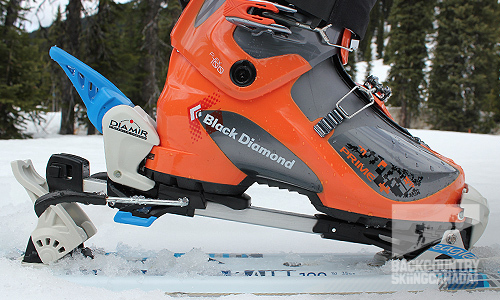 The adjustment means that the binding performs really well when breaking trail. The following images illustrate two of the four heel heights. The rotating toe piece allows lateral release. A close up of the heal piece with wider heel dampener. 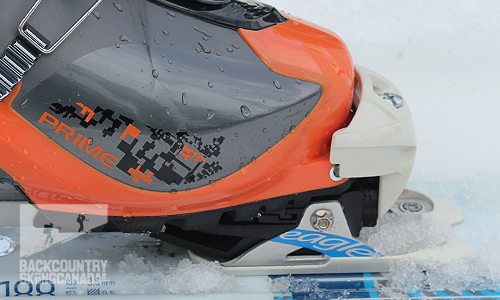 In lock down mode the wider heel dampener and base plate increase rigidity when carving the downhill. 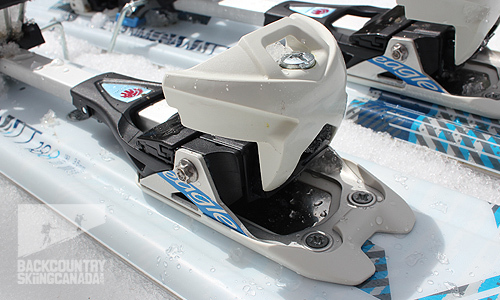 Fritschi Freeride touring pivot lines up with end of boot toe, resulting in less than ideal stride ergonomics. Not so with the Fritschi Diamir Eagle. 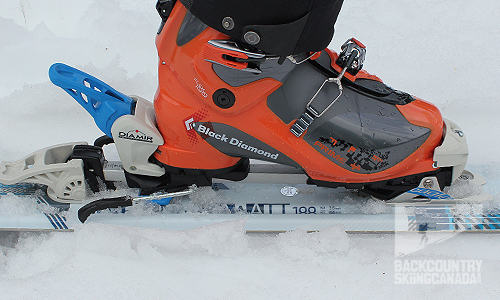 The anti-friction plate with high-quality Teflon strips allows the boot to slip off evenly and without friction – even touring ski boots with rubber soles. Well, there are no surprises here. 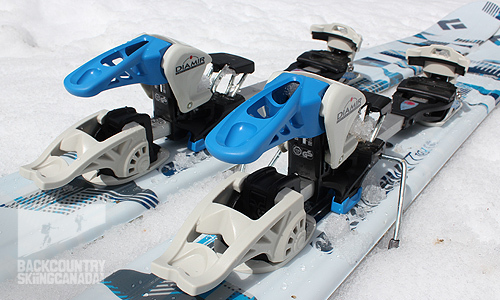 With a few improvements over the original Freeride Pro model the Fritschi Diamir Eagle bindings are still offering a solid option for touring and are robust enough to charge the local resort. Unless you are trying to save weight for those long ski traverses or a Dynafit groupie then you can’t really go wrong with the Fritschi Diamir Eagle. 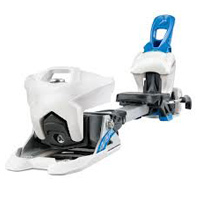 Other frame alpine touring bindings include the Atomic Tracker 16 WTR which is the same binding as the Salomon Guardian 16 AT binding, the Tyrolia Adrenaline 16 alpine touring binding, the Hagan Z01AT binding and the Marker F12 alpine touring binding. 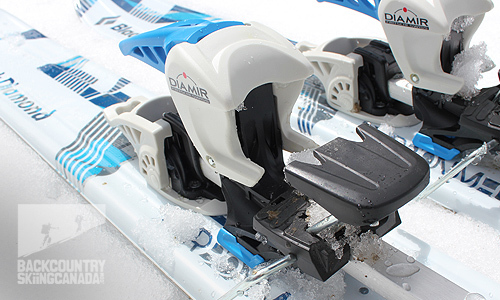 If you are looking for a review of the new Diamir Fritschi Vipec 12 Tech Bindings then click on over here. - Easy transition for those skin rippers out there while offering a tried and tested frame touring binding. - It’s not the lightest or the cheapest model out there. The regular complaint is that it sits high on the ski and therefore detracts from performance with additional flex. I’m not sure this is a great performance killer in deep powder but on hard pack perhaps.